When temperatures start to go down, I am always looking forward for ramen. 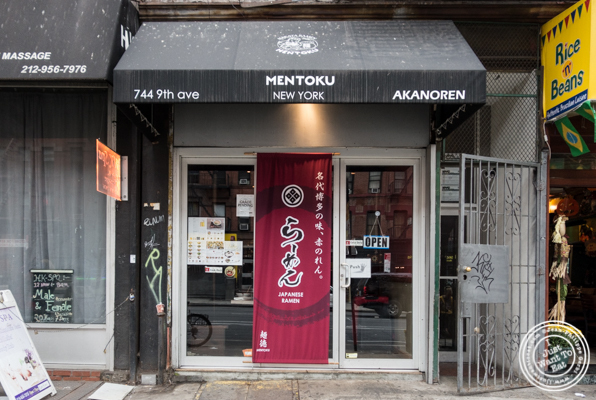 I was really looking forward to try Mentoku in Hell's Kitchen. I saw that place while walking down the street and noticed their spicy ramen with...whipped cream. Not that I was going to try it as it seems to be really spicy, but still, I was a bit curious. We went on a Saturday to this small cash only place that was not as crowded as Totto Ramen that we passed by few hours later. Menu wise, they have a bunch of choices and Jodi decided to go for their lunch special that included a ramen and a green salad for $13. I have to admit that the salad was quite small and thought it was not that much of a great deal considering that the ramen she chose was $11 (so, do the math: the salad was $2 - at the end of a day, the ramen would have sufficed). But I admit that her ramen, vegetarian, was not only surprising, but also delicious. It was the matcha ramen, made with green tea soup noodles topped with konjak, menma, kikurage mushrooms, and soy milk. I thought that the presence of green tea and soy milk was quite original and the taste of it was scrumptious. On my side, I went for a pork bun that was very good, with just the right amount of fat and enough mayo. The pork was perfect, not dry at all. Then came my ramen. I chose the chashu ramen that is the Hakata Genryu Ramen with extra pork. It is made with Tonkotsu pork soup, pork loin chashu, menma and scallions. I loved it: deliciously fatty and tasty, I literally inhaled it. With it, we ordered each a soft boiled egg (ajitama) that was perfect, the yolk being runny. I should mention the noodles that were thin flat egg noodles in both ramen. I loved my lunch at Mentoku: this is a great ramen place and I am sure I will go back to indulge on some more of this noodle soup I often crave.